The new Mercedes-Benz 2019 AWD Revel is the talk of the town right now. Curious about all the fuss? Rent the van called Helmut or Totoro, both Revels, and find out for yourself; rumor has it these vans live up to the high expectations they’ve set. Why so much excitement over these vans? Here’s our current top 10 list of the Revel’s best features. The Revel’s 3-liter turbo-diesel puts 325 lbs./ft. of torque through an on-demand 4WD system and includes a high/low range mode for added off-road capability. 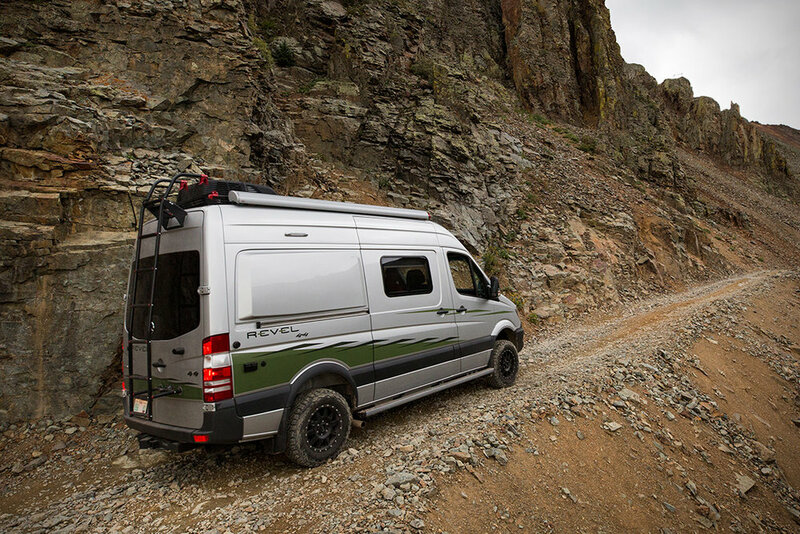 The Revel’s 4WD and burly tires will take you pretty much where ever you want to go. The Revel’s kitchen includes a flameless induction cooktop, stainless steel sink and a refrigerator that actually stays cold! Side panels flip up for extra counter space both inside and outside the van so you can move the party out of the kitchen. There is even a pantry for food storage. The toilet actually swivels so that you can access it more comfortably and the shower has hot water. Don’t want to use these features? No problem. You can turn the toilet/shower closet into an actual closet with hangers and shelves to store your clothes or gear. Rinse off after a day of adventuring with the exterior shower. It has hot and cold water. Is it a super hot day? Plug in at the campsite and turn on the A/C. Would you rather sleep with the sliding doors open? Use the snap-in screens to let the breeze in while keeping the bugs out. Every little modern convenience is included in the Revel. There is no on-board propane with the Revel. Instead the heat is diesel powered and will keep you cozy all night long even in the chilliest of climates. The Revel uses a 200-watt solar system to keep everything powered and running smoothly. With a diesel heat system, a battery array and an AC/DC inverter, you’ll have plenty of power for camping off the grid. You’ve also got 21 gallons of fresh water storage. The awning extends with a push of a button and has built-in LED lights for lighting up the campsite at night. No more stringing up twinkle lights or trying to find batteries for your lanterns. And the awning is smart! If the wind picks up it automatically retracts! How cool is that? The “garage” in the back of the van provides ample storage (140 cubic feet) for your gear, bikes, skis, climbing equipment, etc. Not enough room for something tall or bulky? Push a button and the queen sized, super comfy bed will lift to the ceiling for even more room; bring it back down to sleep! 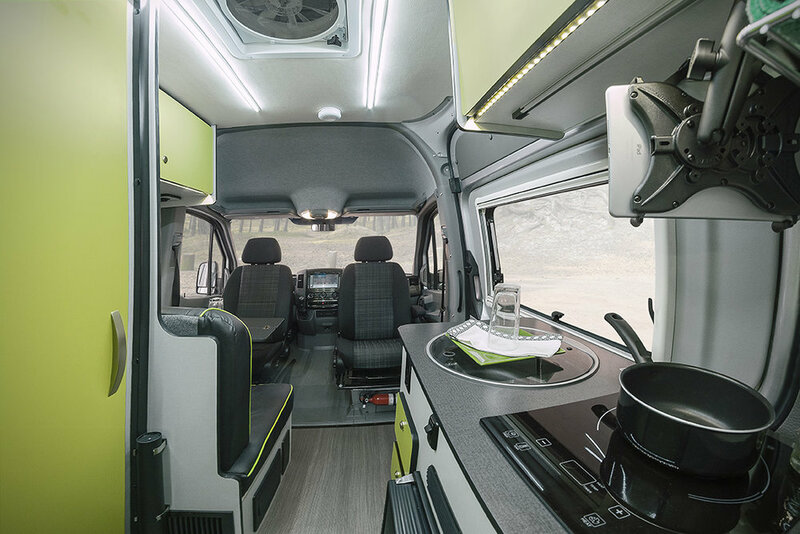 With its bench seat, four can comfortably travel in the Revel. The two captain’s chairs swivel to face the rear, so once you extend the table you can play cards, enjoy a meal or pour over maps and hiking routes. At night, fold the table down and that same bench seat can convert into an extra twin bed so that three people can sleep inside. Our favorite feature? You don’t have to buy one to try one! Rent the van called Helmut or Totoro today and see what all the fuss is about. Both are available for pick up in San Francisco now so you can head to Yosemite, Big Sur – where ever you choose. And keep your eye on the GoCamp website; we’ll be adding several other Revels soon. To reserve Helmut or Totoro, simply click here or the Reserve Now link above.